In this third post in a series, Geni Whitehouse asked Bridget Donofrio, implementer and trainer about her favorite TeraVina features. Bridget, you work with wineries mainly in Direct to Consumer sales. How does TeraVina assist tasting room staff in selling wine? Tasting room professionals need quick and easy access to customer information. They want to make it easy for their customers to buy. They want to be sure to deliver a great customer experience from start to finish. That means: Don’t make customers wait. Don’t ship them the wrong thing. Make the fact that you are on a computer invisible. While they want the order entry process to be invisible to the customer, at the same time they want accurate order entry, timely sales tracking, and automatic winery compliance. Team members and their managers want to monitor sales as they happen– and in a number of different ways. Flexibility and accuracy might seem to be conflicting requirements – but that is the beauty of a system like TeraVina which works in concert with LS Retail, a best of breed point of sale solution, along with many other wine industry applications including ShipCompliant. With TeraVina and LS Retail working together, tasting room staff can login into their account at the point of sale to access a customized dashboard, view customer history, and quickly process an order. Buying information for that customer (across brands and across properties) is at their fingertips. 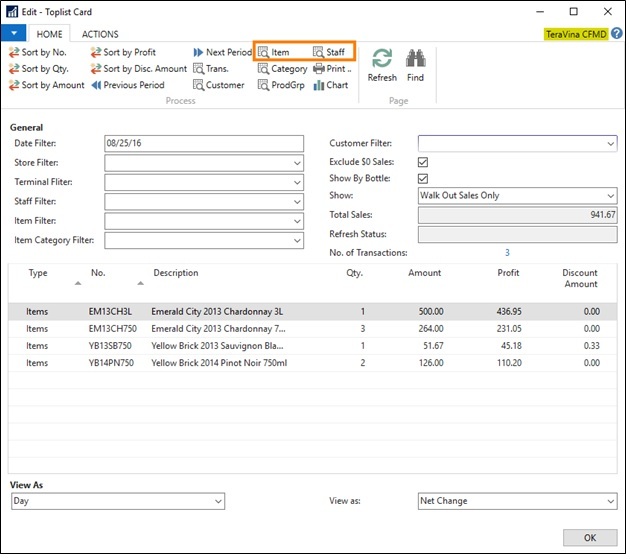 When wine club members arrive in the tasting room, for example, staff members will be alerted about any outstanding wine club pickups along with the payment status of the order – thanks to full integration with the accounting application. Many wineries offer special promotions and programs. How does TeraVina support tasting room professionals in creating and applying promotions at the point of sale? The point of sale dashboard can be customized to include a button for each individual promotion. If a winery offers a discount specific to YELP or members of the Military or requires a coupon code, that information gets stored on a button. The tasting room staff member just pushes the button to populate the discount and link to the promotion automatically. Once a customer is ready to pay, how does TeraVina impact the payments piece? If the customer is a wine club member, the card used for their wine club enrollment will be encrypted and on file but available for purchases they make in the tasting room. Split tenders (multiple payment options) are easily handled. We work with ChargeLogic on the backend for secure payment processing. Does TeraVina support different devices (like tablets and mobile phones) that might be used in the Tasting Room? LS Retail point of sale displays are created using responsive design and are automatically optimized for use on different devices. So far we have covered needs at the point of sale but what about management? What information do they need once the sale has happened? Reporting is really important to managers and their teams. We have created a Toplist report in TeraVina that is essentially a matrix with what ever sales information is needed by a manager and staff. It includes dollars and bottles, by staff member, item, customer, location and can include or exclude zero dollars sales for clearer results. What other issue is important to the success of Direct to Consumer sales? Compliance for wineries is a huge challenge. It is a very complex area and frankly something we are glad we don't have to figure out. The more we learn about wine regulation and the rules and rates and reporting requirements that apply in different states, the more grateful we are for TeraVina's tight integration with ShipCompliant -both in the tasting room and for trade sales. Our clients really appreciate an automated solution that helps them manage everything from the label approval process to shipment limits and sales taxes by state. previous post Is your business sustainable in the event of a disaster? next post What does a system cost?